Revolutionary leader, Governor, U.S. Senator. 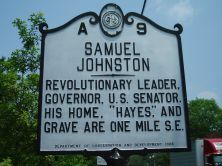 His home, "Hayes," and grave are one mile S.E. 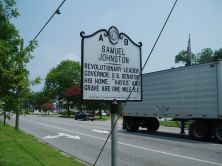 Samuel Johnston (1733-1816), prominent voice for the Patriot cause, lived at “Hayes,” the family estate at Edenton. He was born on December 15, 1733, in Dundee, Scotland, the son of Samuel Johnston and the former Helen Scrymsoure. While still an infant, Johnston emigrated with his family to North Carolina and Onslow County, probably at the invitation of their kinsman, Gabriel Johnston, royal governor of the colony from 1734 to 1752. Johnston’s married Frances Cathcart 1770; their union produced nine children, four of whom lived to maturity. Young Johnston attended Yale College (now University), but left prior to graduation. Returning to North Carolina, he established his residence in Edenton in 1753 and pursued the study of law under prominent attorney and merchant, Thomas Barker. Admitted to the bar in 1756, Johnston began his steady rise to prominence in both North Carolina and the nation. In 1759 he was elected to the colonial assembly, where he would serve continuously as a representative from either Edenton or Chowan County until 1775 and the eve of the American Revolution. As a leader of the Patriot cause, Johnston served from 1774 to 1776 as a member of North Carolina’s Provincial Council. During the same period he was a delegate to the first four provincial congresses, serving as president of both the third and fourth. In addition, he was treasurer of North Carolina’s Northern District from 1775 to 1777, with major responsibilities for funding and supplying the Revolutionary War effort. 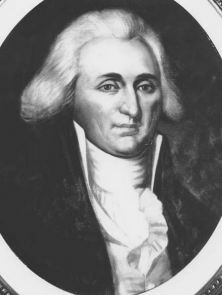 In 1779 Johnston was reelected to the state legislature as a senator from Chowan County. During the following year he entered national politics as a delegate to the Continental Congress. Indeed, in July 1781, he was nominated for the presidency of that body, but declined in order to return to North Carolina for family and business reasons. Through his years in public service, Johnston already won wide respect for his character, wisdom, and dedication to principle, even from his political opponents. When North Carolina’s first constitutional convention met in Hillsborough in 1788, Johnston, a leading Federalist, was elected president, even though the majority of delegates were opposed to ratification. Again he served as president during the following year at Fayetteville, when the assembled delegates voted in favor of ratification. On December 12, 1787, Johnston was elected to his first term as governor, even though he was not a member of the legislature. Although twice reelected on subsequent occasions, he served just over two full terms. His third term ended after less than two weeks, when he resigned to accept election to the United States Senate. As governor, Johnston campaigned successfully with other prominent Federalists for ultimate ratification of the Federal Constitution, promoted national as well as state interests, and exercised a cautious restraint with regard to fiscal and monetary affairs. Returning to North Carolina following his single term in the U. S. Senate, Johnston retired for a while from public life, resuming the practice of law and overseeing his several plantations. He returned to the state legislature, however, as a senator from Martin County in 1798-1799; and, from 1800-1803, he sat on the bench as a superior court judge. Finally, at the age of seventy, he retired permanently from public life. He died thirteen years later, on August 17, 1816, and was buried in the cemetery of his Edenton plantation, “Hayes.” Hayes Plantation became a National Historic Landmark in 1973.